Gabriel Germain Boffrand was a French architect and interior decorator whose mastery of the new Louis XV or rococo style widely influenced 18th-century architecture in France and abroad. Gabriel Germain codified and disseminated the supple rococo style which borrowed, in miniature scale, more from the Italian baroque of Francesco Borromini and Guarino Guarini than from the stringent academic classicism favored in France since the Renaissance. Boffrand's book Livre d'architecture (1745) indicates that he was aware of his role as mediator of the golden mean between reason and fantasy. Through loss of documentation and the demolition of most of the palaces and town houses Boffrand built in Paris and in the province of Lorraine, relatively little evidence of his talents subsists. He is said to have begun his artistic training under the sculptor Francois Girardon, but there is proof that Boffrand worked for the first architect of the king, Jules Hardouin Mansart, from 1686 to 1691 and during 1693-1694. From 1694 to 1709 Boffrand worked on his own in Paris, Lorraine, and the Netherlands, building and remodeling private houses and small palaces. In 1709 he became, under the sponsorship of the new first architect, Robert de Cotte, a member of the Royal Academy and architect of the superintendence of buildings. Boffrand's remodeling of the Petit-Luxembourg is the principal surviving source of numerous examples of his interior designs, and it supplies clues for other attributions to him. Between 1711 and 1715 Boffrand worked in Lorraine as first architect to Duke Leopold, building palaces at Nancy and Luneville and the chateau La Malgrange, all destroyed. Two Parisian houses demonstrate Boffrand's style during the Regency period: the Hotel de Villars (1713 and 1717) and the Hotel de Parabere (1718-1720). In 1723 Balthasar Neumann, architect to the prince-bishop of Wurzburg, brought his plans for the new Residenz to Paris for editing by De Cotte and Boffrand; the latter visited the site at Wurzburg the next year. In 1736 Boffrand undertook the interior design of the Hotel Soubise in Paris, his last and most notable work. 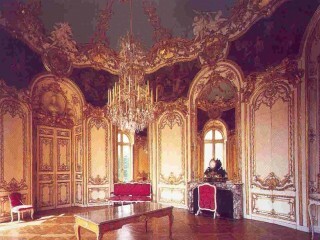 The oval salon is the outstanding creation of the rococo style. Boffrand was a master of integrating convex and concave spatial solids and rectilinear and curvilinear planes. His signal credit as an architect was in having concretized the evolution of the sometimes overly mannered and occasionally chaotic style called the rococo. Fiske Kimball, The Creation of the Rococo (1943), weaves Boffrand into the fabric of the 50-year evolution of the rococo style but underrates his importance as an original contributor. A valuable background study is Germain Bazin, Baroque and Rococo (trans. 1964).